Recently two dermatologists who made groundbreaking contributions to the skincare industry passed away. Both Dr. James Fulton and Dr. Sheldon Pinnell changed the skincare industry as we know making lasting and significant impacts in the field of dermatology and esthetics. Dr. Fulton will probably be remembered best for his research and discoveries connected to acne. He was the co-developer, with Dr. Albert Kligman, of Retin-A, and pioneered cosmetic surgical procedures in order reduce acne scars. Born in Ottumwa, Iowa to Alice Hermann Fulton and James Sr. (a one-time CEO of Cracker Jack), Fulton’s interest in dermatology stemmed from the acne struggles he endured as a pre-teen and throughout adulthood. He earned his bachelor of science and doctor of medicine degrees from Tulane University in 1965, and while there his academic achievements led to his induction into the prestigious Alpha Omega Alpha Honor Medical Society and Phi Beta Kappa Society. While in residency at the Hospital of the University of Pennsylvania, Dr. Fulton met his close friend and mentor Dr. Albert Kligman; together they co-developed Retin-A, a topical form of vitamin A. At the request of Phillip Frost, MD, he relocated to South Florida and earned a PhD in biochemistry under the noted dermatologist Harvey Blank, MD, from the University of Miami Miller School of Medicine in the early 1970s. Fulton and Blank developed benzoyl peroxide gel (Panoxyl) and topical erythromycin (E-Gel). In the early 1970’s with his wife Sara, Fulton launched a successful chain of 12 acne clinics called Acne Healthcare Centers, opened the Acne Research Institute and developed and manufactured a line of patented skin care products under the AHC and Face Up brands in their FDA-approved manufacturing facilities. Here he invented a high-speed diamond fraise for dermabrasion and was the first to use estheticians in the medical office developing a paramedical esthetician training program. In 1990, Fulton opened JEF Medical Group, a cosmetic surgery and dermatology practice where he pioneered fat transfer and laser surgery and was the first to use hyperbaric oxygen chambers for post-surgical recovery. In addition, Fulton and Sara co-founded Vivant Skin Care in 1990, a clinical skin care line rooted in Fulton’s patented vitamin A therapies. Fulton served as mentor and role model for countless leaders in dermatology and esthetics across the nation. Most recently he was volunteer faculty at the University of Miami Miller School of Medicine’s Department of Dermatology and part of the internship program at St. Thomas University. A popular international speaker and teacher, he authored the definitive book Acne Rx and published more than 300 medical articles, the most recent ones being released earlier this year in the Journal of Investigative Dermatology and presented at the Skin of Color Seminar Series in New York City and the Orlando Dermatology & Aesthetic & Clinical Conference. Fulton volunteered his dermatology services to His House Children’s Home, a private, nonprofit, faith-based foster children organization, to which he provided no-charge medical treatment to the children and hosted a yearly Thanksgiving luncheon. He actively split time between Flores Dermatology in Coral Gables where he continued to see patients weekly and his research lab at the Vivant Skin Care headquarters in Miami Lakes until taking ill in mid-June. He was most proud of his beloved wife, Sara, who helped him with his PhD, and worked with him in research and in the medical office. She always attended medical meetings with him and helped with his teaching projects. Fulton always told her he couldn’t have done what he did without her. Among his noteworthy achievements were creating more than 50 original skin care formulations, stabilizing benzoyl peroxide in gel form, qualifying as a Full Fellow of the American Academy of Cosmetic Surgery, membership in the American Society of Lipo Suction Surgery and election to the Dermatology Foundation’s Leader Society. Dr. Fulton passed away from colon cancer on July 4, 2013. Dr. Pinnell, whose research changed the use of topical antioxidants in the skincare industry forever, also passed away on July 4, 2013. Sheldon Pinnell, MD, an internationally eminent scientist, dermatologist, leading scientist behind L’Oreal-owned SkinCeuticals, and J. Lamar Callaway professor emeritus of dermatology and chief emeritus of the division of dermatology at Duke University, passed away peacefully in Durham, NC, on Thursday, July 4, 2013. He was 76. Pinnell’s investigative research has changed the way the world uses topical antioxidants today. As one of the founding fathers of topical antioxidants, he was the first to patent a stable form of vitamin C proven through peer-reviewed research to effectively penetrate skin, delivering eight times the skin’s natural antioxidant protection. Before helping to shape the cosmeceutical industry, Pinnell led major advances in the understanding of skin biology and the parthenogenesis of skin diseases. Early in his career, he made seminal contributions to the understanding of Ehlers-Danlos Syndrome and the role of vitamin C in collagen biosynthesis. Pinnell has been globally recognized for his contributions to science and skin care, most recently receiving an honorary membership to the Society for Investigative Dermatology. Over his lifetime, he also received numerous medical and scientific awards including the “Best Doctors in America, the international Who’s Who in Medicine and Healthcare, Who’s Who in Science and Engineeringand Who’s Who in America. Pinnell has published more than 200 scientific articles in peer-reviewed journals on dermatology topics such as photoaging, collagen synthesis, UV protection, topical vitamin C and other antioxidants. Pinnell also authored approximately 20 book chapters and holds10 patents. “It is our greatest privilege to have been able to help Pinnell bring his discovery of topical antioxidants to life. Prior to the introduction of topical vitamin C in the early 1990s, skin care professionals were largely limited to sunscreens to protect against the deleterious effects of the sun. It was Pinnell who gave the medical community the confidence to transform the approach to at-home skincare. We are fortunate to have known Pinnell as a scientist, a family man and a dear friend. His life lessons and infectious spirit will remain with us forever,” said SkinCeuticals co-founders Alden Pinnell and Russell Moon. Prevention magazine has a great new online feature. 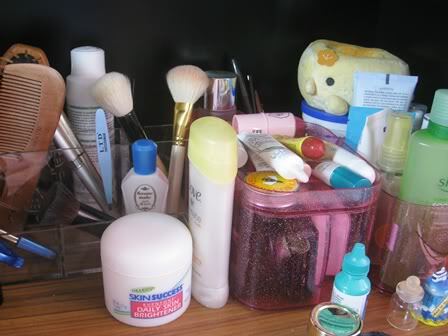 They’ve asked dermatologist to snap a photo of their medicine cabinet and explain what skincare products they use daily. The only common product that all four dermatologists featured each use daily is sunscreen, otherwise what they use varies. Some of the doctors featured are more interested in making sure they have antioxidants in all their products while others focus more on anti-aging. All four do use make-up daily and offer great make-up tips. Have a look – this feature is a lot of fun! The right cleanser – finding the right cleanser for your skin type is super important. In a lot of cases you may need to have more than one cleanser on hand at home. For instance, I always have a gentle cleanser (for removing make-up in the evening and washing my face in the morning) and a salicylic acid cleanser (to fight acne and inflammation which I use in the evening). Making sure that you properly remove all make-up, dirt, and pollution in the evening sets the stage for proper product absorption and better overall skin health and beauty in the end. An antioxidant serum – there are so many great antioxidant products out there so choose one! Protect your skin from free radical damage and inflammation daily while also boosting the power of your sunscreen. Apply every morning after cleansing. This step maintains the skin you have today and prevents further damage in the future. A specialized product – now which one depends on what your skin needs. 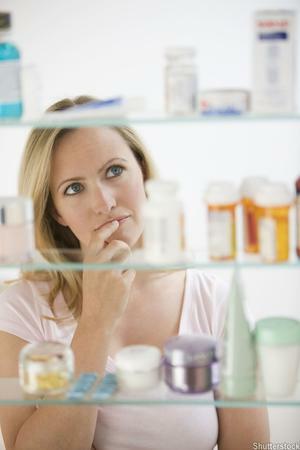 Perhaps you need Retin-A for anti-aging or breakouts (or both). Or maybe you need a lightening product because of sun damage. Most people need something extra to help their skin. The right exfoliant – I am a big believer in lotion/serum exfoliants but if you prefer a scrub use that. Just use something. Exfoliating properly helps your skin look great and makes sure your other skincare products absorb better. Sunscreen – this one should be a no brainer but in case someone needs a reminder you need a sunscreen daily, yes every single day even in the winter, to prevent skin cancer, wrinkles, and hyperpigmentation. So much skin aging is caused by the sun, and there is a simple way to prevent that – use sunscreen. So now that I’ve listed the skincare products I think everyone should have please share your opinion! What do you think?